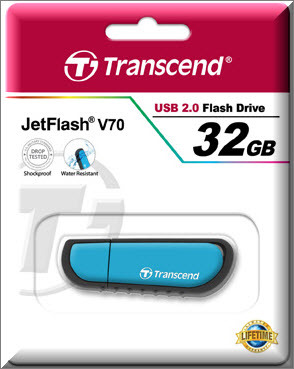 Download Transcend JetFlash V70 usb recovery utility .JetFlash Online formt tool can repair any Transcend USB flash drives such as JetFlash 70 flash disk . Transcend JetFlash v70 usb format tool or "JetFlash Online Recovery v1.0.0.48 " is designed to reformat any corrupted Transcend USB stick .JetFlash Online Recovery V1.0.0.48 can solve write protected problem ,Please insert disk , flash capacity RAW or 0MB or 10MB,upgrade firmware and other Transcend flash drive format errors . Transcend JetFlash v70 online recovery tool can support the following usb disk JetFlash v70 Part Number "TS8GJFV70 - TS16GJFV70 - TS32GJFV70 ". To determine your flash drive information , please read this articles first " Chipgenius software or USB Deview V2.30 utility. Please Read this article to know how to extract your flash drive information "How to repair corrupted flash disk " . How to fix Transcend JetFlash v70 USB flash disk ? First Download Transcend JetFlash format tool from the download links below . Please Note that repair process will delete all data stored on your flash drive. 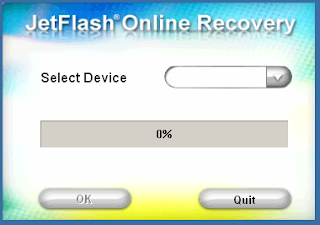 Please back up all your data before using the JetFlash Online Recovery. Insert corrupted Transcend JetFlash v70 USB flash drive to your computer . Click Start to begin format JetFlash v70 Pen drive . what to do if electricity goes off during re-formatting?